Eating breakfast in a hotel is a tedious, expensive and predictable business, to be avoided when possible. I discovered The Troubadour about a decade ago whilst wandering round trying to avoid just this problem, and I’ve been back there every now and again ever since. Opened in 1954, The Troubadour is the last remaining of Earl’s Court’s Fifties coffee houses, the ‘second wave’ of London cafes, the first being the old Seventeenth century dives, the third being the Starbucks led American invasion. The Troubadour doesn’t seem to have changed a lot since 1954, if at all. It has a wonderful shabby look to it, and a very real and hard-won Bohemian edge. There is a feeling that weighty matters of life and philosophy have been discussed between those walls. There was a moment when I thought that I’d run out of luck. When I arrived, the kitchen wasn’t ready, a deep clean not quite finished. This is excellent – I can’t fault a restaurant for taking time and care over cleaning – and I have no problem waiting under such circumstances, especially on a sunny Spring morning with a cup of great coffee and some Blues. 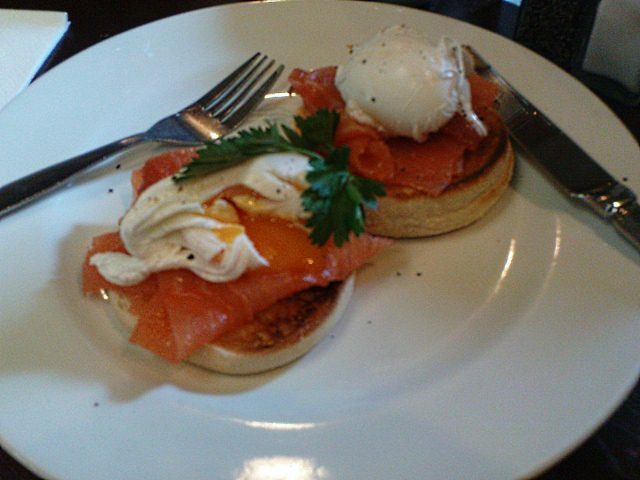 I had an excellent breakfast of smoked salmon and poached eggs on a toasted muffin, with a cup of very, very good filter coffee – dark, smokey and rich. The food was superb. Simple, straightforward, but executed with skill and attention to detail. I must admit I ordered a poached egg because they’re so darn tricky to get right. I use them as a little private test of a cook’s skill. These were absolutely perfect – very fresh, compact, the white set, the yolk runny. I ate breakfast with The Beatles. John, Paul, George and Ringo gazed down from portraits mounted high on the wall, a nod to The Troubadour’s other function as a venue that has played host to many of the best musicians and performers from the Fifties to this day. 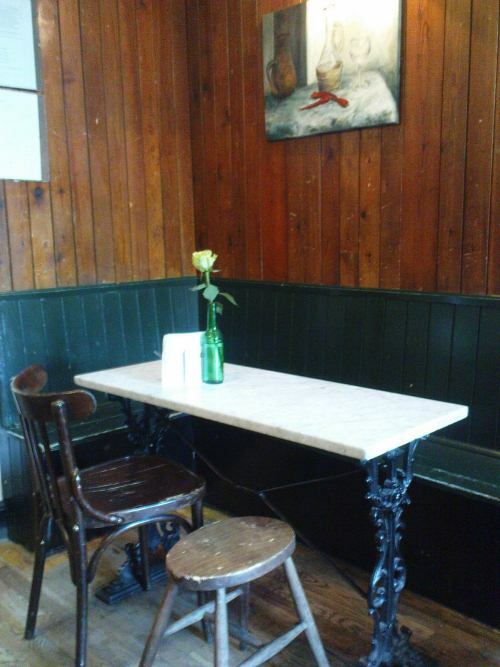 This is where Jimi Hendrix played his first British gig, where Led Zeppelin retired to after gigs at Earl’s Court. My favourite place to have breakfast in London.I’ve given up looking for anywhere better.